We’ve been raving about Apple’s new iMessage feature in iOS 5 all week. If our current findings haven’t piqued your interest in the new messaging service that let’s you ditch SMS messaging, then maybe this little tidbit will intrigue you. With iMessage, Apple is also introducing the best mobile group chat client to ever hit a smartphone. Sure, there are other options out there for mobile group chat, but wrangling all of your friends onto one client is unnerving and they’ll probably just uninstall the app in two weeks without telling you. With iMessage, Apple took all of that pain away. 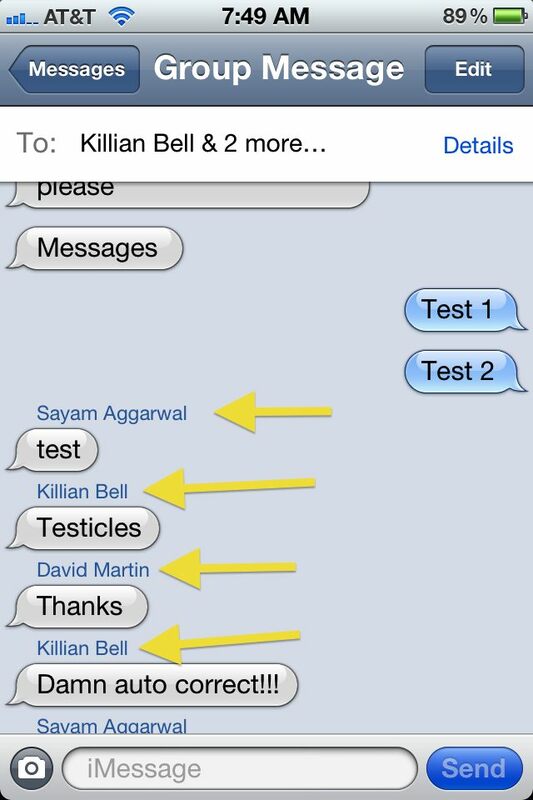 If you want to start a group chat with friends who have an iOS 5 device it works the same way as sending a group SMS text. Select who you want to receive the message, write your message, and then send it off. But here is where iMessage excels (yet again) over SMS: once someone in the group has received and replied to your iMessage, their reply is viewed by everyone else that your original message was sent to (unlike SMS where only you receive their reply). People’s names are labeled above their replies. This allows everyone to view everyone’s replies at the same time and then chat about what everyone else has said. Exactly the same way a group chat work. Acting as a sort of group chat, iMessage makes it ridiculously easy to keep in touch with your group of friends all at once no matter where you are. If your five friends can’t decide what movie to go see tonight, you no longer have to deal with calling or texting them individually and trying to coordinate communication in some haphazard fragmented manner. The ability to instantly get in contact with everyone at the same time is a godsend for people that find themselves struggling to manage communication channels with all friends at once. We’ve been playing around with the new feature here at Cult of Mac the last few days and it’s great. It’s become our favorite way of making fun of John Brownlee without him knowing it….but don’t tell him that.